but also to convert this elegant formula into such an enjoyable product… Cheers! 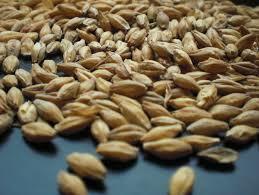 Malting is the process of preparing barley for brewing. The resulting product is a dried cereal grain called Malt. The malting process is comprised of three steps, with each step unlocking the starch within the barley. The steps are: Steeping, Germination and Kilning. Steeping: The barley is sprayed with water and soaked for about 40 hours. 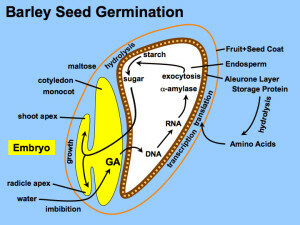 Germination: The soaked barley grows rootlets in the germination room. 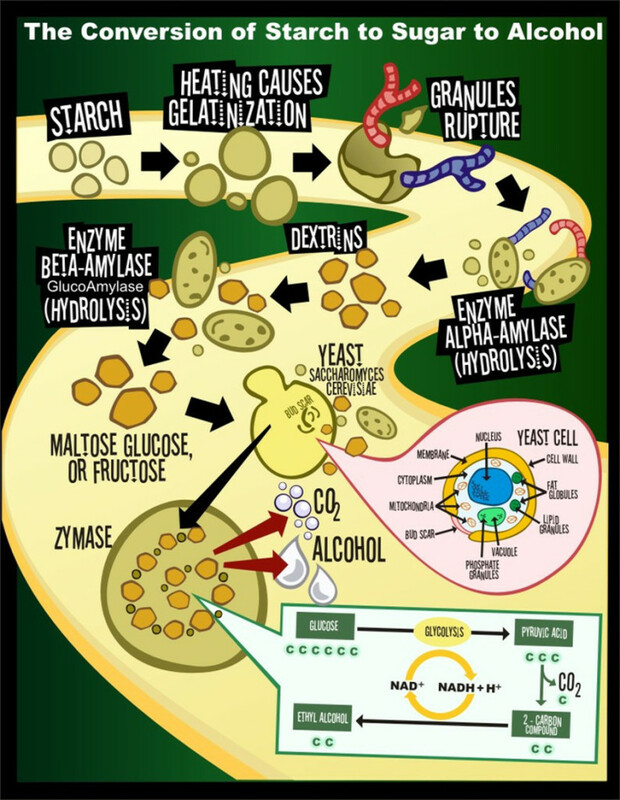 A large number of enzymes, such as α- and β- amylase, are used to convert the grain into sugar. 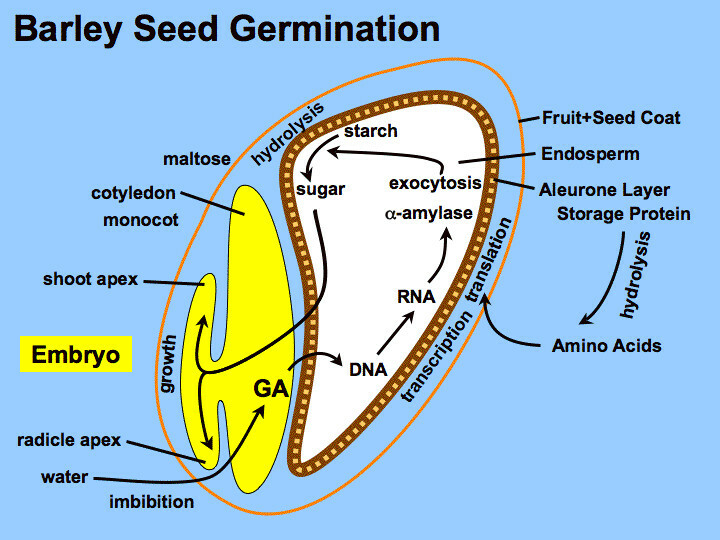 The goal of germination is to break the starches into shorter length molecules. Kilning: After the germination, the barley is dried up in a kiln to preserve the enzymes in the grain. It is important to note that the flavor of beer is related to the temperature at which it is kilned. A higher temperature results in a heavier flavor. After its reception and storage in Malt Silos, the Malt is freed from impurities. Typically the process of Malt cleaning and weighing takes place before the storage of raw materials in the silos. Malt Cleaning: The malt is passed through a destoner in which stones and excess dust are removed. Any metal objects are also removed by using an electromagnet. Malt Weighing: A scale is used to count the amount of malt used for each brew, which is essential to the brewing recipe. 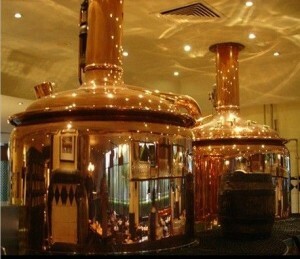 Also called brewing, this is the process where Malt grist, water and hop are combined to produce wort. The German Beer Purity Law precludes the use of any other raw material for beers sold in that country. In other countries, un-malted cereals and sugars are commonly used as additional ingredients. The Wort Production process is comprised the following mayor steps: Milling, Mashing, Mash Separation, Boiling and Wort Clarification. Milling. After weighing the Malt required for a given batch, the Malt is carefully ground in a mill in a way that the husk of the grain is left substantially intact while the contents of the husk become a very coarse flour called grist. The objective is to increase the starch surface area that comes in touch with the enzymes during the mashing process. Infusion process: the total mash is heated with holding steps at temperatures determined by the enzyme’s properties. Decoction process: a part of the mash is withdrawn and boiled. Depending on the number of boiled mash parts, the brewer calls this single, two or three decoction mash process. Mash Separation. Also called lautering or simply mash filtration, is the process by which dissolved substances (called wort) are separated from the undissolved substances (called spent grains). The wort that is gained from the mash is called first wort. On the other hand, the second wort is gained through a process called sparging, where the remaining extract in the spent grains is “washed out” by spraying hot water at approx. 76°C over the surface of the mash while raking arms are cutting groves into the mash to avoid the filter from clogging up. hasten certain desirable chemical changes. To give the beer its characteristic bitterness, hops are added to the wort during the boiling phase, so that the hop components are extracted and transformed (called isomerization) in the boiled wort. During boiling, excess water is also evaporated in order to achieve the right wort concentration (called original gravity) and to blow-off undesirable volatile substances. The end product is the hot finished wort (called casting wort). Wort Clarification. The hot break, coarse break is separated from the wort through centripetal force, due to the rotational flow of the wort in the whirlpool vessel. The sedimented coarse break remains as a compact mass in the whirlpool called trub. Wort Clarification is important since coarse break is detrimental to the quality of finished beer. The Fermentation Process is the transformation of the wort into beer. After cooling down the wort, aerating it, and dosing yeast into it (a.k.a. pitching yeast), the wort is transferred into a fermentation vessel where the yeast goes into a rapid growing phase. Thereafter the fermentation phase is started, where the yeast assimilates most of the dissolved sugars (carbohydrates) and degrades them to ethanol and carbon dioxide while releasing heat. The flavor of the hereby produced young beer (a.k.a. green beer) depends on the wort’s consistency and on the yeast’s metabolism. The following are mayor operations involved in the Fermentation process: Wort Cooling, Aeration, Yeast Pitching, Yeast Cropping, and Propagation. Wort cooling. The clear, hopped wort is cooled to fermentation temperature, usually by means of a plate heat exchanger. Aeration. 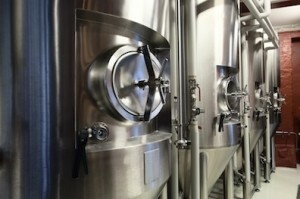 Subsequent to the cooling, air is added to allow the dissolution of oxygen in the wort, which is vital to yeast growth. Yeast Pitching. The yeast is evenly mixed (i.e. pitched) with the wort at temperatures around 18°C for top yeasts, and 10°C for bottom yeasts. Yeast cropping. At the end of the fermentation, the yeast is cropped, harvested or recovered. The main part of the recovered yeast is re-used to pitch the wort in succeeding batches. The other part is considered non-vital, and is therefore sent to the spent yeast cellar. Propagation. This is the process of multiplying yeast in a so called propagator, starting from one suitable yeast strain grown in the laboratory, until the quantity of yeast required for one fermentation is achieved. At the maturation stage, the beer is saturated with carbon dioxide (CO2) under positive pressure. The flavor of the beer is driven to his maturated point, while the sedimentation of waste or surplus yeast is removed and sent to the spent yeast cellar. Maturation may occur in the same fermentation tank, in continuation of the Fermentation process. But it may also occur in a separate maturation tank. The following are mayor operations involved in the Maturation process: Spent Yeast Handling, Filtration, Stabilization, and Bright Beer Production. Spent Yeast handling. This process involves the removal of surplus yeast and its transfer to the spent yeast cellar. 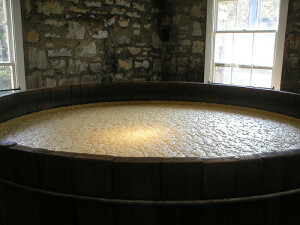 In some cases, the rest beer may be extracted from the surplus yeast and reintroduced into the main stream of beer production, by using a centrifuge or a yeast press. Filtration. The purpose of filtration is to obtain the specified level of haze (i.e. turbitity) in the beer and to increase shelf life. Filtration typically takes place in a diatomaceous earth filter (a.k.a. kieselguhr filter). Perlites (volcanic residues) are sometimes used instead of Kieselguhr. Silica gel (a.k.a Kieselgel) preparation. Both agents can be used together. In addition, antioxidants (like ascorbic acid and sulphites) are used (except when German Beer Purity Law applies). 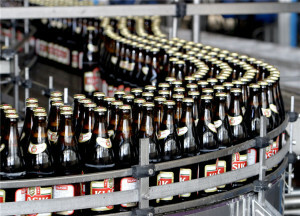 Bright Beer Production. Depending on the type of sales beer, the filtered beer is carbonated to the right carbon dioxide value (a.k.a. carbonation) and sometimes blended with water (a.k.a. blending). The beer from the bright beer tank has to be filled in trading units (glass bottles, PET-bottles, cans or kegs). The following are mayor steps involved in the Filling & Packing process: Depalletizing, Sorting/Screening, Cleaning, Inspection, Filling, Closing, Labeling, Final Inspections and Palletizing. Depalletizing. This process removes the returnable bottles or kegs (a.k.a. trading units) from the pallet for further stages. The pallet is a support for multiple trading units. Sorting / Screening. This process sorts the trading units according to their type, their color, their size, etc. Cleaning. This process removes all dirt and labels from the inside and outside of the trading unit, and to ensure it is sterile for further reuse. Inspection. This process checks the quality of the previous cleaning step, and ensures that the trading unit is ready for filling. Filling. This is the process of filling the trading units with product, while pressurized with CO2. Closing. This is the process of closing-up the trading units with caps. Labeling. 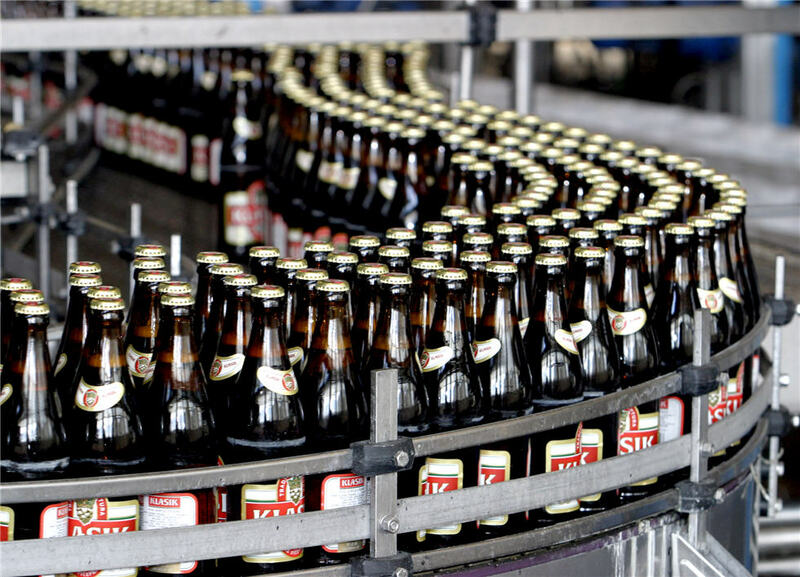 This process decorates the trading unit and provides information such as the composition of the beer, the shelf-life, etc. Final Inspection. This process verifies the trading unit’s degree of deterioration, its fill level, its labeling quality, etc. Palletizing. This process is the reverse of the Depalletizing process, and consists of fitting the trading units back onto the pallet, making them ready for final shipment. This process is typically performed by a CIP or Cleaning In Place plant, which ensures the cleanliness of all product stations, vessels and pipe work, as well as the removal of any contaminants. Generally, caustic soda is used as the cleaning agent. Acid agents are used to remove the hardness deposit, and to neutralize any residue of caustic soda. On the other hand, sterilization is achieved with the use of quaternary ammonium compounds, per-acetic acid, etc. Brewhouse cleaning. 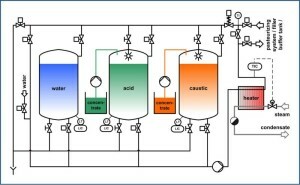 Caustic soda and acid are typically used to clean the Brewhouse. Because all parts of the Brewhouse are in contact with hot wort, it is considered sterile and no sterilization agents are required. Unfiltrate cleaning & disinfection. 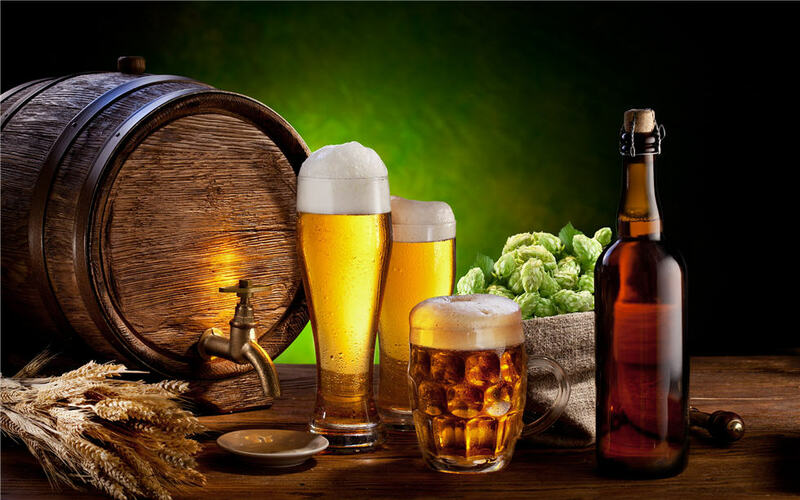 Caustic soda, acid and sterilization agents are typically used to clean and disinfect the tank farms and plant sections that hold the unfiltered beer. Sterilization is critical because of the continuous presence of cold, semi-finished products such as cold wort and young beer, as well as yeast. Filtrate cleaning & disinfection. Caustic soda, acid and sterilization agents are typically used to clean and disinfect the filtration area and bright beer tanks (BBT). As in the Unfiltrate Area, Sterilization is equally critical due to the continuous presence of finished products. 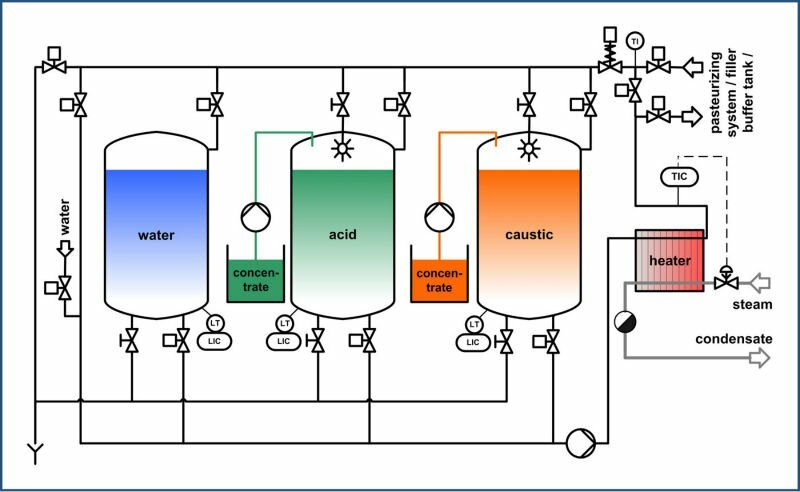 To avoid cross-contamination, separate CIP plants are typically used to clean the unfiltrate and filtrate areas.